Gorgeous little islands, famous botanic gardens, marvelous villas and stunning sceneries – Lake Maggiore – or in Italian Lago Maggiore – is without a doubt one of the most charming locations in Northern Italy. Along its waterside, there are a number of lovely little towns with its very own and typical Italian charm. Famous places are for example Verbania with its districts Intra and Pallanza or the spa town Stresa at the western bank of the lake, which is famous for its numerous villas and palaces. More southerly situated is the city Arona, whereas on the eastern part of the lake there are e.g. the localities Angera with a medieval castle or Luino with a very famous weekly market. However, Lake Maggiore does not only offer wonderful towns and villages: especially the Borromean Islands such as Isola Bella or Isola dei Pescatori are an absolute highlight! 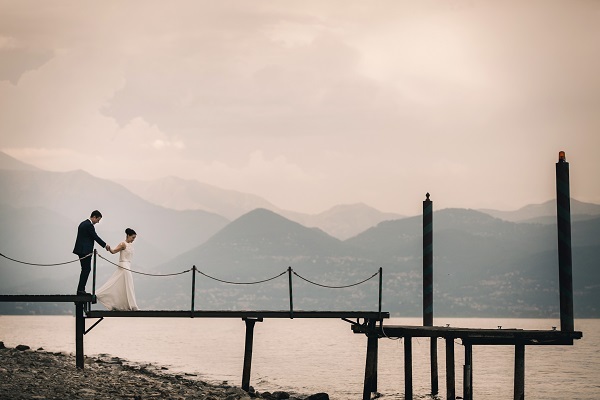 Also for a wedding, Italy’s second largest lake has wonderful locations: on the one hand, there are a vast number of splendid villas, which were once owned by noble families from Northern Europe and are still very well preserved today. Those villas are perfectly suited for symbolic weddings or elegant wedding receptions. Civil marriages can be performed in the town halls of the communes around Lake Maggiore. A very nice example is the town hall of Cannobio which can be reached by boat. As most of the villas have private landing stages as well, you have the possibility to return to your villa by ship which is a really lovely idea! Also for those who wish a religious wedding ceremony, Lake Maggiore offers a huge number of amazing options: The churches Sant’Agata in Novaglio, Sacro Monte di Ghiffa or Chiesa San Remigio in Pallanza are only a couple of examples for the many fantastic churches of the communes at Lago Maggiore. Another example would be the Church San Vittore which is located on the wonderful fishing island “Isola dei Pescatori” and offers either catholic ceremonies or blessings. In addition, also Lake Orta offers a huge number of great possibilities for wedding ceremonies, receptions and wedding parties right at the lake.